Chimney Installation and setup, Repair, Cleaning, Preventive Maintenance Protection & all services. A Clean Chimney means a safer, more efficient fireplace and home heating appliance. Hence, Har Ghar Sewa is providing you a door step Service for a Cleaner and Efficient Running Chimney in Delhi. 1. When the technician arrives he will perform a preliminary chimney safety inspection to determine if you need a Chimney Deep Cleaning or just Filter Cleaning in it. 2. He will make sure if everything is in proper order, that there are not any cracks, clogs, deterioration, or safety hazards. 3. He will do a proper Cleaning of Chimney by using Chemicals and Hot Water to make it Clean and Effective running condition as it was earlier. If you are in need of a chimney cap, minors Repairs, or part change like Chimney Motor, Chimney Blower, Chimney Filters, the technician will usually be able to take care of that at the time of the cleaning and give the best prices of the parts of Electric Chimney. 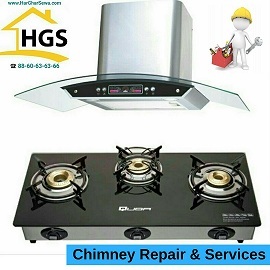 Har Ghar Sewa deals in Service and Repair of all types of Chimney whether it be Steel Chimney or Glass Chimney and all types of Brands too like Sunflame Chimney Repair and Service, Elica Chimney Repair and Service, Kaff Chimney Repair and Service, Prestige Chimney Repair and Service, Glen Chimney Repair and Service, Hindware Chimney Repair and Service, etc. Har Ghar Sewa is Offering Chimney AMC at cities Best Prices Starts from 1999/- only which includes 4 Services in a Year and covers only Cleaning Part, AMC do not includes any Parts of Chimney. Experts say that in the place like DELHI where delhiites are fond of spices and spicy food which creates and make more clogs in chimney, so to make sure that everything in chimney works fine like Chimney Blower, Chimney motor, Chimney Filters, etc. with your kitchen and fireplace; Customers are recommended to get their Chimneys Filter Clean in every 3-4 month and Chimneys Deep Cleaning once in a year. Why Har Ghar Sewa - Chimney Service? We offer city’s best possible chimney repairing staff for maximum satisfaction of our customers at best possible rates. 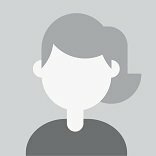 You get professional and experienced staff to provide you the service. To ensure that there are no frauds, our service providers will have an i-card of Har Ghar Sewa and a standard tool kit with them.